Although her exemplary service in Seattle lifted her disciplinary transfer, Raleigh lands a hometown civil rights case riddled with problems that could get her sent away again. When she helps out a fellow cop, her life goes on the line, forcing her undercover in a sting operation. As Raleigh realizes the lines are crossing and double-crossing, her domestic life starts to unravel. Her mother's mental health cracks like ice, her closest friend grows cold, and her old boyfriend DeMott comes a-calling, hoping for more than chestnuts by an open fire. I love a good suspense or mystery novel, and The Clouds Roll Away kept me on the edge of my seat. My sister actually has a degree in forensic science, and we always used to watch the forensic-type TV shows (CSI, Law & Order, etc.) This book made me feel like I had stepped into the world of forensics in the same way that these shows do. It was almost like a movie version of what could've been an episode of CSI (although with more a much more personal plot line for the forensic scientist). I also love reading about strong women, and Raleigh, the heroine, is as strong as they come. She's an amazing role model for women everywhere (even if she does seem to have a knack of getting herself into trouble). Raleigh is also a spiritual woman, so the novel has definite Christian undertones. I don't mind it too much, because in most cases of faith, Christian and Jewish values mesh well together. When the going gets tough, G-d will be there for you and will help you get through it. Overall: We give The Clouds Roll Away a 9/10! You can find out more about Sibella Giorello, the author of this and other books, at her website and her blog. 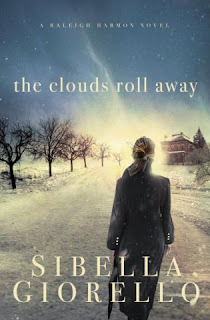 Sibella is celebrating the release of The Clouds Roll Away by giving away a Kindle prize pack worth over $150.00! One Grand Prize winner will receive the latest generation Kindle with Wi-Fi and a $25 gift certificate to Amazon.com. To enter simply click on the icon below and follow the directions on her blog. Then tell your friends!! The winner will be announced January 3, 2011 on Sibella's blog. We were sent The Clouds Roll Away free of charge for the sole purpose of this review; no other compensation was received. All opinions expressed are my own. Thank you for your thoughtful review. So glad you enjoyed meeting Raleigh! Love the baby calendar above -- wow, what an inspiration. Best to you and this beautiful new arrival.